Array of Solutions offers prompt, inexpensive mold testing within twenty-four hours of your inquiry. If you are looking for mold experts and searching for “mold removal Greenville SC” online, then Array of Solutions will be the best choice for you. It offers mold testing and removal services across Greenville, Spartanburg, Pickens, Greer, and Travelers Rest in South Carolina. Over 10 years, Array of Solutions serves people in these areas with their household mold cleaning. We are experts in black mold removal, which is a dangerous mold for your house. Our company is also expertise with other services like Water Damage Services, Basement Waterproofing, Crawl Space Solutions (encapsulation, repair, vapor barrier, insulation, waterproofing etc), Air Quality Testing, and Hoarding Inspection & Cleaning. Many folks here in the Upstate, Greenville, specifically call about Mold Remediation. There is often a need for this, however; Mold Inspection is the first step in Greenville. This includes a Mold Inspection. Before and Mold Removal can take place, a Mold Inspection needs to be performed to see what exactly it is that is going on. More times than not, Crawl Space Encapsulation is found to be necessary prior to any Mold Remediation inside the home. Crawl Space Solutions include but are not limited to Mold Remediation under the home followed with the installation of a thorough Crawl Space Vapor Barrier. Crawl Space Vapor Barriers should be at least six millimeters thick and completely cover all exposed earth. Crawl Space Insulation may need to be removed prior to Crawl Space Encapsulation in order to effectively perform Mold Remediation. If Crawl Space Insulation is affected by Water Damage, it may be failing and require re-fastening and positioning using small metal rods called Tiger Teeth. Water Damage is the leading cause, requiring Mold Remediation, Mold Testing and Mold Inspection. Greenville, SC is one of the fastest growing cities in the United States. WHY YOU NEED MOLD EXPERT? If buying or selling a home in Greenville, Mold Testing and Mold Inspections are going to be part of the buying and selling process. Mold Inspections can prevent health issues such as; ‘Sinusitis’, ‘Rhinitis’, Hay-Fever, Allergies, Head-Ache, Fatigue, Insomnia, Skin Rashes and often times depression. A Simple Mold Inspection can prevent future Mold Removal, and the need for Crawl Space Encapsulation, and or Insulation. Although Arrayofsolutions.com offers the least invasive and most effective solution to your Air Quality issue, it can and sometimes does cost as much as two dollars per square foot when dealing with Crawl Space Encapsulation. Offering discounts to senior citizens, disabled and veterans Arrayofsolutions.com will perform Mold Inspection, Mold Testing, Mold Remediation, Mold Removal, and Crawlspace Encapsulation at the lowest possible price. Array of Solutions is a reliable mold removal companies in Greenville, SC. It is established in 2005 by Douglas Whitehead. Since 2005 Douglas is serving people with mold and water damages across Upstate, SC as a mold expert. Array of Solutions come in the category of the environmental consultant by its services. We are dedicated to serving for mold inspection and removal, water damage restoration & repair, air quality issues, hoarding inspection and clean up. 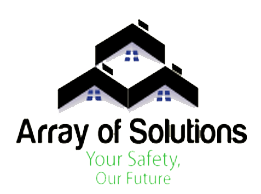 At Array of Solutions, our ultimate goal is to serve you and make your experience a pleasant one, and our team will stop at nothing to ensure that you come away more than satisfied. When you choose Array of Solutions to inspect your home, you can always rest assured that: All our employees have been hand-picked for experience, competence, and courtesy. We will never add any hidden fees – the initial quote will be the all-inclusive final price. We will provide an accurate and comprehensive report detailing your home’s condition. We will answer any questions and try to make the experience an educational one for you. In need of mold removal? Contact us today. Array of Solutions Your safety is our future!